Born to a wealthy and distinguished pagan family. Trained in law and rhetoric in his youth. Brother-in-law to the Roman governor of Palestine. His father died when Theodore was age 14. The boy had originally planned to study at the law school in Beirut, but when he arrived at Caesarea with his brother-in-law's entourage, he encountered Origen, head of the catechetical school in Alexandria, Egypt. He and his brother Athenodorus each gave up the idea of law school, became students of Origen, and converted to Christianity; Theodore changed his name to Gregory. Studied philosophy and theology for seven years under Origen. Returned to Pontus c.238. Bishop of Caesarea, a diocese with only 17 Christians when he arrived. Gregory converted most of his bishopric; tradition says there were only 17 pagans left at the time of his death. Instituted the celebration of martyrs, teachings about the saints, and celebration of saint feast days as a way to interest pagans in the Church. During the Decian persecutions c.250, he and his flock fled into the desert. Worked among the sick when the plague struck soon after, and with refugees during the invasion of Pontus by the Goths in 252. Attended the First Council of Antioch in 264 and 265. Opposed the heresies of Sabellianism and Tritheism. Used his legal training to help his parishioners, and settle disputes between them without taking their problems to the civil courts controlled by pagans. Oversaw the council that chose Saint Alexander the Charcoal Burner as the first bishop of Comana. Saint Macrina the Elder heard Gregory preach many times in her youth, and passed his wisdom onto her grandsons Saint Basil the Great and Saint Gregory of Nyssa. Noted theological writer. • Saint Gregory of Nyssa writes that the Wonder-Worker was the first person known to receive a vision of the Theotokus. The Virgin and Saint John the Baptist appeared to him in a vision, and gave him what became a statement of doctrine on the Trinity. • Gregory had the power of healing by laying on of his hands. Often the healing was so powerful that the patient was cured of his illness, and became a fervent convert on the spot. • During the construction of a church for his growing flock, the builders ran into a problem with a huge buried boulder. Gregory ordered the rock to move out of the way of his church; it did. • In order to stop the River Lycus from its frequent and damaging floods, Gregory planted his staff at a safe point near the river bank. He then prayed that the river would never rise past the staff. The staff took root, grew into a large tree, and the river never flooded past it again. This act led to his patronage against floods and flooding. • Two local pagans, hearing that Gregory was a soft touch for money, decided to con the bishop. One lay beside the road where Gregory was travelling, and pretended to be dead. The other stopped the bishop, pleaded poverty, and asked for money to bury his dead friend. Gregory had no money with him, so he took off his cloak and threw it over the "dead" man, telling the "live" one to sell the cloak and use the funds. When Gregory had moved on, the "live" con-man found that his friend had died. • Two brothers in Gregory's diocese had inherited a piece of land that contained a lake. Unable to decide how to divide the lake, the two settled on armed combat to settle the matter. On the night before the battle, Gregory prayed for a peaceful solution to the matter. The next morning the brothers found that the lake had dried up leaving easily dividable farm land. • During Gregory's time in the desert during the Decian persecutions, an informer told the authorities where to find the bishop. Guards went to the site, but found nothing but two trees standing in isolation in the desert. The informer went back to the place and found that what the soldiers had seen as trees were actually Gregory and a deacon in prayer. This convinced the informer of the reality of Gregory's God, and he converted. • When returning from the wilderness, Gregory had to seek shelter from a sudden and violent storm. The only structure nearby was a pagan temple. Gregory made the sign of the cross to purify the place, then spent the night there in prayer, waiting out the storm. The next morning, the pagan priest arrived to receive his morning oracles. The demons who had been masquerading as pagan gods advised him that they could not stay in the purified temple or near the holy man. The priest threatened to summon the anti-Christian authorities to arrest Gregory. The bishop wrote out a note reading "Gregory to Satan: Enter". With this "permission slip" in hand, the pagan priest was able to summon his demons again. • The same pagan priest, realizing that his gods unquestioningly obeyed Gregory's single God, found the bishop and asked how it was done. Gregory taught the priest the truth of Christianity. Lacking faith, the priest asked for a sign of God's power. Gregory ordered a large rock to move from one place to another; it did. The priest immediately abandoned his old life, and eventually became a deacon under bishop Gregory. This ordering about of boulders led to Gregory's patronage against earthquakes. Princess, the daughter of King Andrew of Hungary. 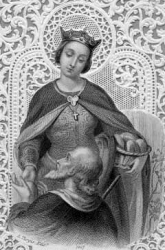 Great-aunt of Saint Elizabeth of Portugal. She married Prince Louis of Thuringa at age 13. Built a hospital at the foot of the mountain on which her castle stood; tended to the sick herself. Her family and courtiers opposed this, but she insisted she could only follow Christ's teachings, not theirs. Once when she was taking food to the poor and sick, Prince Louis stopped her and looked under her mantle to see what she was carrying; the food had been miraculously changed to roses. Upon the death of Louis, Elizabeth sold all that she had, and worked to support her four children. Her gifts of bread to the poor, and of a large gift of grain to a famine stricken Germany, led to her patronage of bakers and related fields. Elizabeth was a lifelong friend of the poor and gave herself entirely to relieving the hungry. She ordered that one of her castle should be converted into a hospital in which she gathered many of the weak and feeble. She generously gave alms to all who were in need, not only in that place but in all the territories of her husband's empire. She spent all her own revenue from her husband's four principalities, and finally she sold her luxurious possessions and rich clothes for the sake of the poor. Twice a day, in the morning and in the evening, Elizabeth went to visit the sick. She personally cared for those who were particularly repulsive; to some she gave good, to others clothing; some she carried on her own shoulders, and performed many other kindly services. Her husband, of happy memory, gladly approved of these charitable works. Finally, when her husband died, she sought the highest perfection; filled with tears, she implored me to let her beg for alms from door to door. On Good Friday of that year, when the altars had been stripped, she laid her hands on the altar in a chapel in her own town, where she had established the Friars Minor, and before witnesses she voluntarily renounced all worldly display and everything that our Savior in the gospel advises us to abandon. Even then she saw that she could still be distracted by the cares and worldly glory which had surrounded her while her husband was alive. Against my will she followed me to Marburg. Here in the town she built a hospice where she gathered together the weak and the feeble. There she attended the most wretched and contemptible at her own table. Apart from those active good works, I declare before God that I have seldom seen a more contemplative woman. Born to the nobility, the son of William, Lord of Avalon. His mother Anna died when he was eight, and he was raised and educated at a convent at Villard-Benoit in France. Monk at 15. Deacon at 19. Prior of a monastery at Saint-Maxim. Joined the Carthusians in 1160. Ordained in 1165. In 1175 he became abbot of the first English Carthusian monastery, which was built by King Henry II as part of his penance for the murder of Thomas Becket. His reputation for holiness spread through England, and attracted many to the monastery. He admonished Henry for keeping dioceses vacant in order to keep their income for the throne. He resisted the appointment, but was made bishop of Lincoln on 21 September 1181. Restored clerical discipline in his see. Rebuilt the Lincoln cathedral, destroyed by earthquake in 1185. Hugh denounced the mass persecution of Jews in England in 1190-91, repeatedly facing down armed mobs, making them release their victims. Diplomat to France for King John in 1199, a trip that ruined his health. While attending a national council in London a few months later, he was stricken with an unnamed ailment, and died two months later. Legend says that his father was a Saxon, his mother a Jew who converted to Christianity; the two met while they were both on pilgrimage to Rome, Italy, they married, and then settled in the Val Venosta in the Italian Tyrol region. Educated by Father Alexander at the parish of Saint Peter in Remüs (modern Ramosch), Switzerland; previous minister's there include Saint Othmar of Saint Gall. Ordained in Unterengadin, Switzerland, he served as the parish priest at Saint Peter's in Remüs, living like a hermit and caring for the poor. Miracle worker who turned water to wine which he then gave away to the poor. Daughter of Hereric and Breguswith. Sister of Saint Hereswitha. Grand-niece of King Saint Edwin of Northumbria. 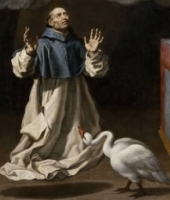 Baptized in 627 at age thirteen by Saint Paulinus of York. Lived as a single lay woman until age 33 when she became a Benedictine nun at the monastery of Chelles in France. Abbess at Hartepool, Northumberland, England. Abbess of the double monastery of Whitby, Streaneshalch. Abbess to Saint Wilfrid of York, Saint John of Beverley, and three other bishops. Patroness and supporter of learning and culture, including the work of the poet Caedmon. Hilda and her houses followed the Celtic liturgy and rule, but many houses had adopted the continental Benedictine rule, and the Roman liturgy. Hilda convened a conference in 664 to help settle one a single rule. When the conference settled on the Roman and Benedictine, they were adopted throughout England, and Hilda insured the observance of her houses. Born to the nobility, his parents were Hungarians who had fled to the Dauphine area of modern France to escape Arian persecutions. Lived as a hermit in a cave. Spiritual student of Saint Evurtius of Orléans. Priest. Monk. Abbot of the Saint Laurence Abbey in Orléans, France. Bishop of Orléans. Organized the defense of Orléans during the invasion of Attila the Hun, met with Attila and prevented him attacking the city in 451. Greek Catholic. Studied theology in Rome, graduating in 1907. Ordained on 9 October 1907. Vice-rector and professor of theology at the Stanislaviv, Ukraine seminary. Entered the Basilian novitiate on 2 October 1911. Bishop of Premeshyl, Poland on 23 September 1917. Imprisoned for his faith by Polish authorities in September 1945. Died in prison. One of the Martyrs Killed Under Communist Regimes in Eastern Europe. Born to the Gallic nobility; great-nephew of Saint Eustadius. Friend of Saint Magnericus and Saint Senoch. 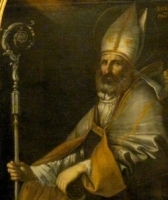 While on pilgrimage to the shrine of Saint Martin of Tours, his obvious piety led to his being chosen bishop of Tours, France in 573, taking the name Gregory on his ordination. An excellent bishop for 20 years; Pope Saint Gregory the Great thought highly of him. Historian and writer; his works are our best historical source for the Merovingian period. Jesuit priest. One of the Jesuit Martyrs of Paraguay. Born to the nobility. Married in her youth to Colomon, a prince of Hungary. Widowed, Salomea followed a call to religious life; she became a Franciscan Poor Clare nun, founded a monastery, and eventually serving as its abbess. Dominican priest. Studying in Palermo, Italy and Salamanca, Spain. Missionary to Mexico, the Philippines and Japan. As he travelled, he wrote a book on the lives of Dominican saints. Martyr. Priest in the Archdiocese of Sens, France. Imprisoned on a ship in the harbor of Rochefort, France and left to die during the anti-Catholic persecutions of the French Revolution. One of the Martyrs of the Hulks of Rochefort. Brother of Saint Victoria of Cordoba. Martyred in the persecutions of Diocletian. After their deaths, their home was turned into a church. They have an office in the Mozabic Liturgy, and devotion to them is widespread throughout Spain and France. 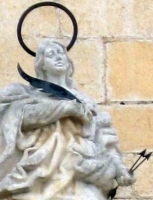 Sister of Saint Acisclus. Martyred in the persecutions of Diocletian. After their deaths, their home was turned into a church. They have an office in the Mozabic Liturgy, and devotion to them is widespread throughout Spain and France. Monk at Constantinople. Skilled painter of icons. Opposed the Iconoclasts under emperor Theophilus. He defended sacred images, and restored those that were defaced by Iconoclasts. For his work he was arrested and tortured. When the Iconoclasts fell from power, Lazarus was released and given a prominent place in the new regime, eventually becoming ambassador to Rome. Dominican missionary priest, first Formosa and then Japan. Tortured and martyred in the persecutions of Tokugawa Yemitsu. Cistercian Benedictine monk. Spiritual student of Saint Bernard of Clairvaux. Served as first abbot at the abbey in Novara, Sicily. Spiritual student of Saint Ambrose of Milan. Deacon in Florence, Italy, working with Saint Zenobius of Florence. Tortured and martyred in the persecutions of Diocletian.